Over one hundred second-year graduate students from all three SAIS campuses attended the welcome Italian dinner Wednesday at Kenney Auditorium. 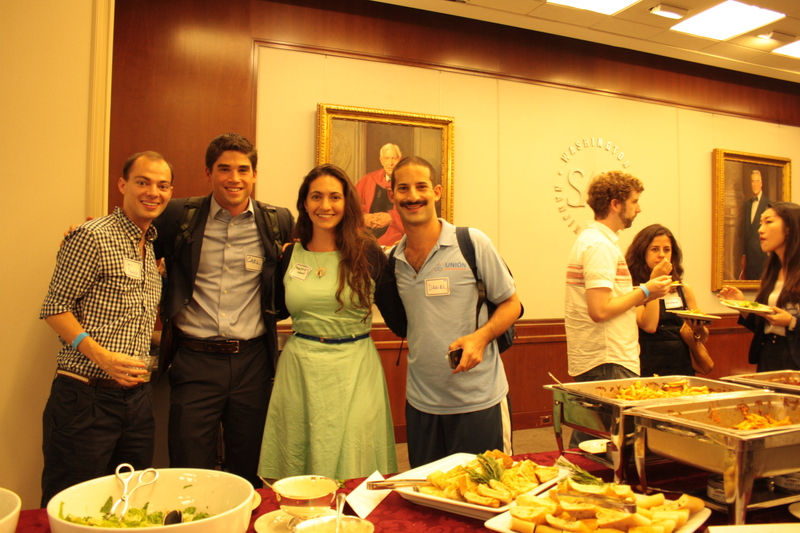 The event was one of many hosted by the SAIS Washington SGA aimed at integrating students from the different campuses at the beginning of the year. To that end, the SAIS Washington SGA randomly assigned seating to ensure that students from the different campuses would have a chance to mingle. While the dinner’s theme emphasized Bologna with pasta and Bolognese sauce, Chinese fortune cookies on the tables honored the Nanjing Campus as well. Prompting nostalgic shouts across the room was a slideshow of photos from the different campuses that was played on the screens above the tables. Brito and SGA Social Chair Mark Radin also included video collages of the Bologna class’ first few days of apartment hunting in the ancient European city. It was footage of then-strangers awkwardly answering questions about their new lives. In that light, it might have occurred to some, that what seemed strange with new classmates at the Italian Dinner, might one day be remembered just as fondly over dinner with friends in one year’s time.